The Australian Competition and Consumer Commission has taken action against TVI Express for promoting "the alleged pyramid selling scheme". The US State Of Georgia's Office of Consumer Affairs has issued a "Cease and Desist" order against them. Then, a lot closer to home, the Bank of Namibia has outlawed them. Just last month they were declared illegal in Indonesia. They also appear to have been shut down in South Africa. BUT, they're still operating in Botswana, taking people's money and lying to them, promising them huge returns. Remember this is a scheme that has no product and which offers money solely based on recruiting other people beneath you. That's a pyramid scheme. Anyone running TVI is either a cheat or a fool. One day soon they might also find themselves as a convict. Read this coming Friday's column in Mmegi for details of one recent victim. P.S. Does anyone recognise this couple, who the TVI Express web site says are from Botswana? The other people they quote don't appear actually to exist. Do these people? It’s one of my favourite words because it has two important meanings. Critical can mean “crucial” and “essential” and we all know that consumer are both of those things to a business. Well, WE know that but not all businesses seem to have realised this. An example. We had a complaint recently from a small start-up company that engaged a web design company to construct their web site. P3,000 later no usable site existed, they were making silly excuses about their failures and then they went silent. Clearly they don’t want to make a success of their business. They seem to have forgotten the critical thing, their customer. Another company was engaged to repair a consumer’s stereo system in July 2009, two full years ago. During this, probably the world’s longest repair period, the store confessed that they lost some of the components and weren’t capable of fixing it. They offered to replace the device at their cost and then offered cash instead. Since then it’s just been excuses. Another critical consumer ignored. I’m sure I don’t need to remind you that the biggest culprits in the Forget What’s Critical League of Infamy are the monopolistic parastatals. Our power provider seems, despite the efforts of some of their staff, to have absolutely no idea that consumers matter. Despite their manifest and scandalous failures in ensuring power supply they still seem to operate as if we’re the ones who should apologise to them when things go wrong. The only one of the parastatals that I think have shown any improvement in recent years is BTC but that’s only because they’ve had to confront some competition from Mascom and Orange. They’ve been forced to get off their backsides and do something to keep us making phone calls with BTC phones. Meanwhile I still think it’s disgraceful that we pay a small fortune for unbelievably slow internet connections in Botswana, most of which are controlled by BTC in one way or another. My mother, who has the misfortune to live in the UK, has an internet connection at home that is 32 times faster than mine here. I pay P399 a month for mine, hers is entirely free, provided by her telecoms supplier with her phone line. If we, as a nation, really want to attract companies to work from our business parks and innovation hubs then we need to provide them with power and internet connections that don’t make us look like a third-world nation. Which, in case you’ve forgotten, we’re not. My dictionary says that the word “critical” can also mean “involving an analysis of the merits and faults” of something. That’s the bit that’s important to you and me. I know it’s boring but until all consumers analyse the merits of the things we want to buy then we’re asking for trouble. You can start by being extremely skeptical about any advertisement that uses the words “natural” or “organic”. Neither of these words actually mean anything useful. Cow manure is both natural and organic but that doesn’t mean you want to eat it in a pie. Just because a health product says it’s natural, that doesn’t mean it will actually DO anything for you. Just like homeopathic remedies, which are perfectly “natural” because they’re no more than water. They have precisely no active ingredients. Just like there’s no evidence that they work at all. In fact, the only thing there IS evidence about with homeopathy is that they simply don’t work. Any effect they have is no more than a placebo effect. You should also be careful when dealing with the people inside stores who are trying to sell you things. Remember that almost certainly they’ve been trained how to sell things. You haven’t been trained how to resist them. Some salespeople, particularly those selling used cars will have been trained, weird though it sounds, to keep you waiting as long as possible. Once they discover you’re interested in a particular vehicle they’ll sit you down in the office and disappear. They might say they’re off to see their manager to negotiate a special discount but in reality they’re doing nothing of the sort. They’re relying on what psychologists call “self-justification”. The longer you wait, the more you will subconsciously explain to yourself that there’s a reason for it. You must really want the car. Many furniture stores as well as car dealers will create a sense of urgency by letting you know that there’s a time limit on a special offer. “The offer is only for this weekend and will never be repeated!” Of course you do know that the offer will be there next weekend and every other weekend as well, don’t you? One of my favourite sales tricks is when the salesperson, particularly when you’ve been a bit challenging, will ask you “What’s the one thing stopping you from buying?” Of course there isn’t ONE thing stopping you buying, there are several but the moment you answer the question you’ve played into his hands, allowing him to focus on just one objection rather than several. You’ve made the sale a bit easier for him. Needless to say the weapons you should take when buying something expensive is are skepticism and knowledge. And assertiveness. If the salesman asks you to wait in his office while he negotiates for you, politely say no, you’d rather come back later. When they say there’s a time-limit, call their bluff and point out that the same offer existed last weekend. Are they really going to call you a liar? If they ask what’s the one objection you have, tell them that you have five and which one do they want first? Above all, remember that the salesperson’s nightmare is seeing you from behind. The moment you can’t get what you want, politely remark that in that case you’ll give it a miss and turn your back on them and walk out. If a good deal really exists they’ll chase you and offer it to you. If they don’t you know you didn’t want to buy from them anyway. I saw an advertisement for “Immune solutions” and treatments for “sugar diabetes”. Do you think they can be real? No, they’re not. I contacted the advertiser and asked him whether he could really offer treatments for the conditions he mentioned. The list also included “Heart Health”, “Low Blood Pressure” and “Arthritis”. He was very careful to stress that “Its not MEDICINE” but nevertheless told me that it could help with prostate cancer and “a lot of various ailement and serious health conditions”. 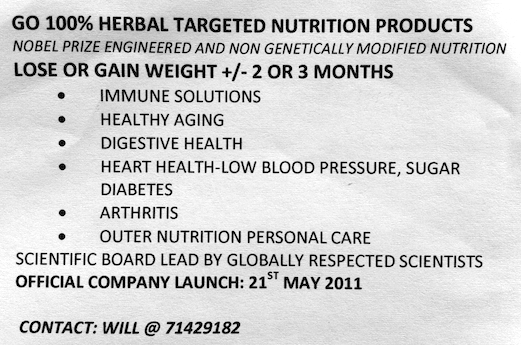 He also confirmed that it was Herbalife products he was using perform these miracles. I pointed out that by claiming these miraculous effects he’d broken certain sections of the Penal Code, that he wasn’t registered as a medical practitioner and that he was in breach of the Consumer Protection Regulations by quoting “scientific or technical data in support of a claim unless the data can be readily substantiated” and by promising “outcomes where those outcomes have no safe scientific, medical or performance basis”. That’s when he got angry and starting sending me some rather silly abusive messages. I have no particular problem with Herbalife products. While very few people actually need supplements or vitamins if they have a fairly healthy diet it’s nevertheless their choice if they want to waste money on them. It’s their money. But Herbalife products do not cure cancer or boost your immune system. If you don’t believe me you should ask Herbalife themselves. 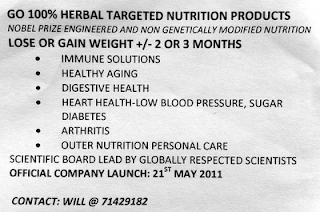 I forwarded the advertisement and the various messages I got from the advertiser to Herbalife and they were as appalled as I was. Their Vice President for Europe and Africa said that making “specific claims related to individual medical conditions is unacceptable” and that they would “correct the individual concerned”. Hats off to Herbalife for stepping in quickly, a dunce’s cap for the guy peddling miracle cures. I got an e mail offering me an opportunity to make easy money. I know you warned people about schemes before but can you advise? This is yet another “Get Rich Quick” scheme and like all of them it’s nonsense. The web site for this scheme, which calls itself “OneX” suggests that “You only pay $5.00 one-time out of pocket. As a wiser man than me once said, “Extraordinary claims require extraordinary evidence”. Their web site fails magnificently to explain how it will really work. They have an online video that explains that by giving $5 you enter a network of people who will, miraculously and with no obvious reason, start giving you money. Lots of it. However at no point does it explain exactly why they would be insane enough to do this, or how you ‘ll actually be paid this fictional cash. Also, they’re ever so slightly deceptive when they claim that “You only pay $5.00”. 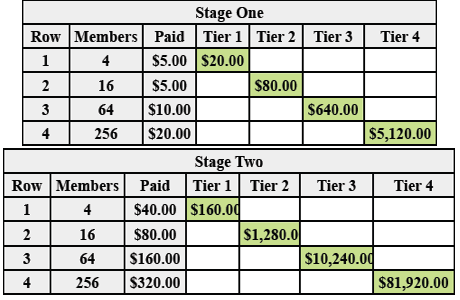 In fact you pay $5, then another $5, then $10, $20, $40, $80, $160, $320, all out of the thousands they suggest you’ll earn. 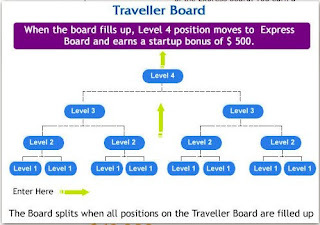 This is no more than a pyramid scheme. Actually they do say they’re not a pyramid scheme because they sell a product, What might that be? Educational material on how to run pyramid schemes. Ironic, don’t you think? Steer well clear of all Get Rich schemes because the only person who will get rich is the crook behind it. Certainly not you. Your car air-con and benzene. A risk? No. According to a research, the dashboard emits Benzene, a cancer-causing toxin (carcinogen - take time to observe the smell of heated plastic in your car). And on and on and on it goes. Fortunately this is all nonsense. It's a hoax. There is no connection between your car air-con and benzene fumes. Any link between benzene and cars is to do with fuel, not the air-con so the lesson is simply not to stick your nose up your exhaust pipe. For an informed discussion of the facts, see the American Cancer Society response and Snopes. The Herbalife quack distributor has been told off. Do you think it's possible that my recent "I can cure cancer with Herbalife products" crook has been told off by Herbalife? I have a terrible confession to make. Some years ago, I was employed for a few years by a well-respected, privately-owned American company as, take a deep breath, a consultant. I hate the term “consultant”, not for any principled reason but because most of the consultants I’ve ever encountered have been hugely expensive, massively disruptive and utterly useless. Of course I was an exception, being naturally brilliant, talented and good-looking. That’s what I kept telling myself at least. Actually, and here comes my defence mechanism, I wasn’t really a consultant. I had a fairly comprehensive knowledge of a particular suite of business software and was thought to be able to communicate this knowledge fairly well. Over the years I also think I developed a few skills that were also potentially useful but I think I knew my limits. I certainly wasn’t a expert on everything. Also, and this was one of my strengths, I had previously been employed by a former customer of this software company, had then been employed by them and had some real-life experience of their products. I’ve always maintained that “consultant” wasn’t the right word for what I did. I would have preferred to be called something like a “product specialist” but that wouldn’t have been acceptable to my employer. They had fallen for the 90s fad of calling everyone other than the cleaner a “consultant”. They also seemed to think, as many companies still do, that calling someone a consultant enables you to quadruple the amount customers are expected to pay for their time. By far the worst offenders. in my humble opinion, are those consultants wielding that business weapon of mass destruction, an MBA. Before I go too far I should say that there are some perfectly respectable people out there with MBAs. However a large proportion seem to believe, or perhaps just their employers believe, that possession of this piece of academic witchcraft allows them to pontificate on everything under the sun. I witnessed, many years ago, a bunch of MBA-stamped consultants help design the layout of a large new hospital and place the drug dependency unit, which treated drug addicts next to the hospital pharmacy. The same team placed the proposed in-patient and out-patient departments for elderly patients on opposite corners of the hospital, several floors apart. Worse than consultants over-extending their sphere of expertise is the fact that many of them have no core expertise either. How many of them have ever actually had a real job? Many years ago, when I was young, inexperienced and hideously idealistic and before I became jaded and grumpy I thought I wanted to be a social worker. Luckily, before committing myself I managed to get an interview with the Head of Social Work in the area I lived. You’re an excellent candidate he told me, just the sort of person we need to work in social work. Now go away he told me and come back in 20 years time when you’ve some experience of real life, then we’ll employ you. That was 25 years ago and I haven’t been back yet. However his point was a good one. In management as much as social work, the real strength someone can offer is experience, not a qualification. If I want to employ someone to advise me on how to run my parastatal, government department, hospital or private company I’ll look for someone who’s actually done it for real a few times, not just some graduate barely able to wipe his or her own, errr, nose. Just last week Mmegi reported on the attempts that had been made by the Bokamoso Private Hospital to resurrect themselves from the financial grave in which they had buried themselves. On two separate occasions they launched “six-month plans” to get themselves back to normal. Both were catastrophic failures. Ironically (yes, I know I’m spoiling my own argument here) it took some consultants, Deloitte & Touche (who were actually probably accountants) to point out that the management team “had operated without a well-defined operational plan or short-term cash flow forecast and appeared inadequately experienced to turn the business around”. Roughly translated I think that means they hadn’t got a clue what they were doing. I think that’s correct and here’s an example why. Bokamoso hospital has 150 beds. If all of these beds are available every day of the year you have nearly 55,000 “bed-days” to occupy. The initial plan by the management projected that they might have 33,000 in-patients in 2013. But that simply doesn’t work out. Do the maths. In order to accommodate these 33,000 people the management would need to kick every in-patient out of the hospital, on average, after 40 hours. That’s an average remember, so for every patient staying for 4 days you’d need to kick out another two after only 12 hours in bed. And that’s before you realise that you can’t afford to employ doctors because you’ve spent all the money employing security guards to kick out the patients. Of course I have no evidence that anyone with an MBA had anything to do with this fiasco but I wouldn’t be at all surprised, would you? Maybe there’s a bigger problem? That, as a nation, we’re mathematically clueless. Hospital managers can’t do simple activity projections, consumers can’t calculate how much they’re being ripped off by stores that sell crap on credit and very few of us can estimate the damage done by teachers going on strike. Maybe what our nation needs a whole lot more than consultants is a massive influx of talented maths teachers? I found some information on Facebook about a herbal treatment for HIV. The name of the product is Baariz, they have a website and contact details. Is what they say true? No, it’s lies from beginning to end. They do indeed have a web site and a Facebook group and they are, in my not-very-humble opinion, cheating, lying, verging-on-homicidal fraudsters. What they offer is no more than dangerous pseudoscientific nonsense. 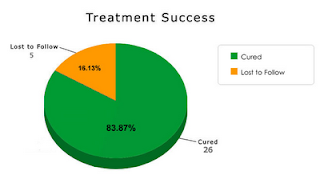 They clearly claim that they can "cure" HIV and that they offer "treatment success". Their web site gives precisely no scientific evidence that their product works. It shows no more than some very dubious individual test results that I simply don't trust. It mentions what it claims are publications regarding their product but none of the links it gives actually work. Correction: they do suggest that God or Allah might have a role to play but they don't explain how. I can also see no actual description of what their product actually is other than it "has herbal origin" or that it is a "magic drug". This sort of thing should be avoided at all costs. It's nonsense and no more than a money-making scheme. Also, trading in this product in Botswana would be illegal. Peddlars of miracle cures are all scumbags but those that peddle "cures" and "treatments" for serious conditions like HIV infection and AIDS are the worst of all. We should all be very glad that we live in a country civilized enough to deal with the threat of HIV/AIDS in a rational, logical and scientific way. Despite all the challenges we’ve achieved a great deal with free ARVs and the PMTCT program. Allowing criminals like these charlatans to sell fake cures undermines everything we’ve achieved. 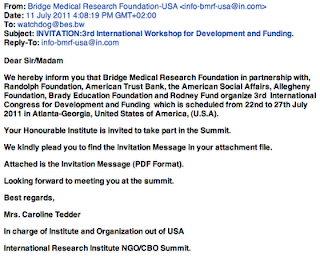 I received an email inviting me to a conference in the USA. I just have to pay $350 registration fee. Is this a scam? "The Bridge Medical Research Foundation was established in 1990 by Hinger H. Norman, Jr., and is dedicated to supporting innovative, high risk/high impact biomedical research." No such person ever existed. None of the other organisations mentioned have anything to do with this fake Foundation. There is no “3rd International Congress for Development and Funding” planned, anywhere in the world. It is, without a doubt, a scam. check, 100% Guaranteed!) I hope you will allow me to be of service to you. Sincerely. Contact us via email: (globalfinancialhome001@gmail.com)"
that you will not disappoint us in this very loan transaction. ahead and i hope i can trust you?" Does anyone actually need to be told that this is a scam? What organisation lends like this? What lender has English as bad as this? He's a scammer. I’m a big believer in education. Not necessarily in the traditional sense, not necessarily in classrooms, with some boring lecturer droning on about out-dated theories about dull subjects, I mean something more than that, something better. A mistake that people often make is that they confuse qualification and education. Qualifications are tangible records of a specific educational achievement. Let’s take mine as an example. I have a degree from a university that I worked moderately hard for. OK, correction, a degree for which I did as little work as possible and spent all my time reading the much more interesting material that wasn’t on the reading list. However I learned a few things that mattered more than the principal subject, like research methodology, the scientific method and skepticism. 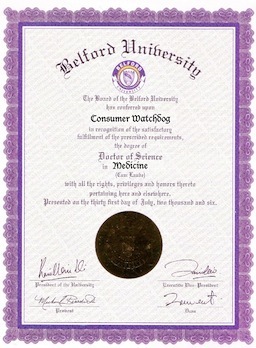 Later on in life I was ordained as a Minister of Religion from an entirely silly online church and followed that up with an entirely fake doctorate the certificate for which that I stole from a ridiculous online diploma mill calling itself “Belford University”. Quite clearly my “qualifications” are largely useless and they certainly haven’t really benefited me in any way recently, certainly not the joke ones. Actually the genuine degree I have did help get me my first job but since then it’s been experience that has, I think and hope, allowed me to achieve anything professionally. What’s more important is education in the wider sense. I think that there is real value in learning for it’s own sake. I think it’s important for everyone to know about the wonders and majesty of evolution, the history of civilisation and it’s failures and about arts and culture. I am convinced that it makes us all better people. Clearly there’s an advantage in knowing more about how the world works, partially because knowledge is just good, but also it’s one of the few free weapons we have to protect ourselves. Last week a reader contacted us to ask about a problem he had with insurance. Some months ago he reversed into someone else’s car, causing considerable damage. He had no insurance although luckily she did. Her insurance policy covered the repairs in full but the reader was surprised when the insurance company contacted him demanding money. Was this correct, he asked? Clearly some insurance education is needed. An insurance policy protects the interests of the insurance company’s customer, nobody else. The only person who would benefit from the insurance policy in this case is the woman who bought the policy, not the person who trashed her car. What’s more, the insurance company didn’t trash the car either and they’re entitled to try and get their money back as well. If he’d been insured it would have been his insurance company coughing up the cash but as he wasn’t, it’s him they’ll chase for the money. Put simply, if you’re not insured you have to pay for the losses you cause. However most people don’t understand this. How many of us have actually been taught how insurance actually works? Perhaps this should be taught in school? I used to think that but now I think differently. I think that if an industry, like insurance, wants to make money from us then they should start educating us. It’s up to them to explain to us, to teach us what their products actually do. It’s not unknown for this to happen. Some years ago Stanbic Bank published a series of booklets for school kids on banking. They explained, in just the right tone, and with just the right level of detail, how banking actually works. I thought I knew banking but I learned new things I didn’t know before. I’d like to see the same thing from other industries. I’d like to see the insurance industry itself educating it’s existing and potential consumers on what insurance is and how it works. However I don’t expect this to be a passive thing. I don’t think consumers should need to go out of their way to be educated. They can use the newspapers, radio and the TV to actively pursue us to give us knowledge. It’s in their interests of course, they want us as customers but I think they also want us as educated customers, customers that choose the correct product and don’t end up massively angry when we later discover we were sold the wrong thing. They also, presumably, want a community that understands their products and doesn’t get upset when someone else’s insurance policy doesn’t cover them. Obviously I think this about consumer protection, mainly because nobody in a position of authority seems to have actually read the Consumer Protection Act and Regulations and nobody at all with any power seems to want to enforce them. But why not with the law as well? Why not with any of the “professions”? It can’t be because they prefer consumers to be ignorant, can it? Can they really believe that they’ll make more money if they keep us in the dark, can they? Surely these industries aren’t like those “holiday clubs” that seem to rely on confusing their victims into signing irrevocable contracts that they can’t ever leave? So here’s my appeal. Let’s see these industries starting to educate their customers on how things work. Or would they rather let Consumer Watchdog do it for them? Moemi and the Conference Team at the Cresta Lodge in Gaborone for going out of their way to make things happen. I was recently involved in road traffic accident when I bumped into a vehicle whilst reversing. The Police were called and I was charged with driving without due diligence and care. The other party’s car was insured and mine was not, so I had to fix mine at my own cost. I thought since the other party’s car was insured, the Insurance Company would pay for the cost of the repair. I recently received a demand from the Insurance Company that I should refund them the whole cost of repairing the vehicle. My question is whether it’s procedural for me to pay the whole cost of the repairs or any of it? If it was expected that I should, why was I not involved in identifying a suitable garage/Panel Beater to negotiate the cost of repairs? I think the amount I am demanded to pay is way too much for the damage that I thought occurred. Unfortunately for you, yes this IS how things work. The insurance policy that the other person paid for is there to protect her against any losses from accidents and theft, not you. At the end of this story she shouldn’t have suffered financially as a result of something beyond her control. The insurance company have now paid for everything to be repaired, that was their side of the deal with her. However they ARE now entitled to try and recover their costs from you. It was you, after all, that caused the accident. Where possible insurance companies are entitled to attempt to recover their losses from guilty parties and that’s why they’re now chasing you. However I do think you’re entitled to ask them to justify the amount they are trying to recover. Presumably they would have got several quotes for the repairs and chose the best value one. You’ve a right to see how much it cost and a right to be charged a sensible amount of money for the repairs. I have a problem with my employer. Last month I didn’t get my salary as usual I ended up getting paid by a cheque on the last day of the month which was on the 30th of June, but our agreement with my employer was that I must get paid on the 25th of every month. Unfortunately my bank charged me because there was no money in my account for the stop orders on the 27th and 29th, now I don’t have money. The bank charged me P560 because I didn’t have money in the bank on those dates. My employer’s accountant says it’s not their problem because they deposited my money on the 23rd, I went to the bank with my query and they told me that they didn’t receive any money to my account from my employers bank. Our accountant just says I cant get my money so I must forget about it. The thing is its not my fault, is it? It most certainly is NOT your fault. It certainly seems from what you say that your employer has massively failed you. The single biggest obligation an employer has towards his or her employees is to pay them the right amount of money on time. A decent employer understands that employees have their own obligations like stop orders that go out at the end of the month and they must do their best not to ruin their employees’ lives by paying them late. With your permission we’ll get in touch with your bank and we’ll ask them to trace the payment and to confirm exactly when they received the money from your employer’s bank. If it turns out that your employer did indeed pay you late and therefore caused you all these problems they’ll have to compensate you for the bank charges you incurred. Simple as that. If they don’t I think you should approach the Department of Labour and ask them to intervene. If not, if you’re feeling really mean we can always call them for you. Do you think they deserve that? On the other hand, if it turns out that one of the banks was at fault, well, they have lots of money, they can afford to compensate you. 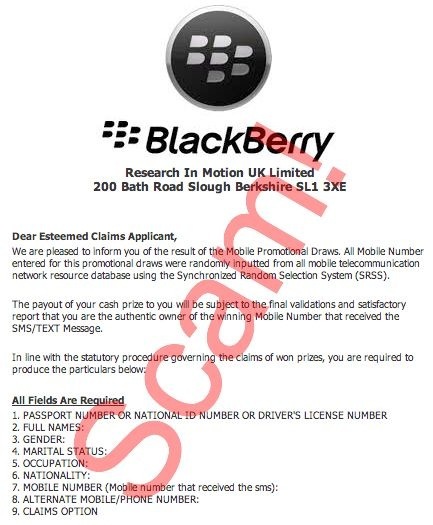 I got an SMS from a UK cell phone number (+44 7425 219 870) stating that I have been awarded 2,000,000 pounds by RIM-Blackberry. I was then asked to email my name and country which I did and then later I was sent an email asking for my personal details like my passport number. Is this a scam or am I two million richer? It’s a scam, no doubt about that. There’s no point in responding to the scammer unless you want to waste his time. 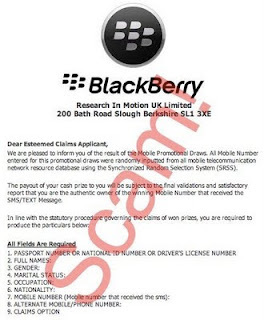 Just make sure that you don’t send any money to anyone connected with this scam. If you feel like wasting a Pula why don’t you send him a really, incredibly rude text message telling him what you think about him? To their credit Herbalife have taken full responsibility for this rather crazy "independent contractor". Their Vice President for Europe and Africa told me that making “specific claims related to individual medical conditions is unacceptable” and that they would “correct the individual concerned”. It started with this advertisement, found in a doctor's practice. For the record I have no problem with Herbalife offering health "supplements" although I question how many people actually need them. I do have a problem with offering "cures" for serious desease, but so do Herbalife! We received an email from a reader who asked about a so-called "herbal treatment for HIV" called Baariz. They have a web site and a Facebook group and they are, in my not-very-humble opinion, cheating, lying, verging-on-homicidal fraudsters. This is dangerous pseudoscientific nonsense. They clearly claim that they can "cure" and that they offer "treatment success". Of course their web site gives precisely no scientific evidence that their product work. It shows no more than some very dubious individual test results that I simply don't trust. It mentions what it claims are publications regarding their product but none of the links they give actually work. Correction: they do suggest that God or Allah might have a role to play but they're not clear how. I can also see no actual description of what their product actually is other than it "has herbal origin" or that it is a "magic drug". It's nonsense and no more than a money-making scheme. Also, trading in this product in Botswana would be illegal. Peddlars of miracle cures are all scumbags but those that peddle "cures" and "treatments" for serious conditions like HIV infection and AIDS are the scumbaggiest of all. In comes a simple advance fee scam from the "Bridge Medical Research Foundation" inviting total strangers to a fully paid conference in Atlanta, Georgia entitled "3rd International Congress for Development and Funding". Well, it's fully paid except the "registration fee of US$ 350". Their web site is a mixture of text stolen from the William J Clinton Foundation web site which is enough of a clue in itself, don't you think? I know these days everyone is talking about how Chinese is the language you need to learn and I’m sure there’s some truth in that. However, whether you like it or not, English remains the language of international dealing, certainly in our part of the world and also in those regions where we have the closest historical ties. It’s certainly the language of the internet and despite things like the Google home page and Microsoft Office both being available in Setswana, a knowledge of basic English is essential for navigating the web. That’s one of the reasons why I oppose anything that gets between a kid and his or her command of English. Of course there are people who will argue that local, cultural language is an essential part of a person’s heritage and I’m not going to deny that but, at the risk of seeming like I disagree with our founding President while knowledge of one’s culture is important, it’s not as important as having a job. There’s also the lemming-like anti-globalisation campaigners that oppose anything that even looks like greater freedom of movement of goods, services and people and also language. However I’m quite happy to leave people who would rather live in the Middle Ages, up to their necks in pestilence and death, where they want to be. As well as the technological world our legal world is dominated by the English language. What language is it that’s used in most advertisements, all contracts and in the court cases that follow when things go wrong? English again. That’s another reason why I think a good command of English is critically important. I’d even say that it’s more important than Maths as a tool for consumer survival. Unfortunately there are people out there that will shamelessly exploit people’s less than complete command of English. I’ve mentioned before a scheme that included in it’s contract a clause that declared the contract “irrevocable”. That’s a word rarely used in common speech and it takes a moment of thought to understand it. It means not revocable. It means it can’t be cancelled. Ever. Of course nobody draws the victim’s attention to this when the scheme is being sold. They wouldn’t, would they? Let me remind you. The customer signed this agreement at the time they bought the goods and before they had been delivered. Nevertheless they were required to sign a document saying they’d seen them already and had approved them. The agreement suggested that the goods could be as faulty as the store liked and the consumer has no right to get them fixed. In other words, even if they hadn’t understood the contract, nobody had tried to explain it to them and they don’t know what the word “contend” means, they promise never ever to say so. This is extremely slippery. So slippery in fact that I suspect any court would throw it out for being plain deceptive. Bad quality English is, however, sometimes very useful. It’s particularly good at helping you spot a scam. Last week we saw a scam email that went as follows (I haven’t made any changes to the spelling). So far, almost all the scams I’ve seen have included at least one clue that the author isn’t either a native English speaker, or someone with a good grasp of the language. I think it’s safe to assume that a banker or lawyer who communicated with you out of the blue about a serious financial transaction would have fairly good English, don’t you? I wonder if I should start offering classes in English For Scammers? I’m sure they must realise that it’s an area where they need to improve and, for an astonishingly high fee, I’m prepared to step in and help. I went to a furniture shop today and what they told me is that some charges like handling fee and insurance are compulsory so I would like to know if they are telling the truth? I suspect that they’re telling the truth, at least partially. Although I’ve never quite understood what a “handling fee” actually is, they’re perfectly within their rights to charge you it so long as you agree up front. Unfortunately you probably won’t see any reference to this until the very last moment before you sign the contract. You’ll probably also see other charges as well, things like a compulsory delivery charge, even if you pick up the furniture yourself. The reason they sometimes insist on delivering? That way they know for sure where you live so that when they need to repossess your goods they know where to find them. As for the insurance I think it’s a greyer area. You should ask them what exactly the insurance is for. They’ll probably tell you that it’s to protect you in case the goods are stolen or destroyed. In that case I suggest you politely decline it, saying that you’ll take out your own household content insurance policy if you don’t have one already. What they’ll probably then confess is that it’s actually a payment protection policy that protects THEM if you fail to pay. One of the tricks that some furniture stores play (and they play SO many of them) is to hide the cost of the item you’ve bought in these various charges. They can reduce the amount of money you’ll be paying in “finance charges” by pretending that it’s actually something else, like insurance, handling fees and delivery charges. That way they can also reduce the percentage you appear to be paying for the privilege of buying on credit. I really believe that consumers should avoid buying anything on credit if they can help it. It’s a horribly expensive way to buy things, the “hidden” charges can be enormous and the risks of defaulting are extremely high. The lesson is simple. It will take you half as long to save up for something and buy it for cash than it will take to buy it on credit. Three weeks ago I bought a vehicle from a garage costing me P36,000. After a while I took the car for service but the mechanic found a lot of things missing from the vehicle. I have spent a lot of money within a week of purchase of the vehicle. I told the manager of the company to fix the vehicle or let me swap with another but he refused and says I have to pay for the vehicle. What can I do to swap or let him fix the car? I suspect it’s too late to fix this problem. Of course a decent dealer will do his best to fix problems like this but I think you’ve come across a more traditional second-hand car dealer, the type that gives the profession a bad name. The problem is that the dealer will just say that you bought the car “voetstoots” which is usually taken to mean “as is” or “as it stands”. They mean that you had the chance to check the vehicle before you bought it and that’s it. Of course lawyers might tell you that this can’t be used to cover a major defect in the item purchased. A dealer can’t sell you a vehicle that is utterly useless and claim you bought it voetstoots but in your case the problems seem to be a lot less serious. Some things missing aren’t a major defect, they’re just unbelievably irritating. I think that it’s best to add this to your list of life experiences. Just make sure you spread the word to everyone you know not to do business with this particular dishonourable dealer. 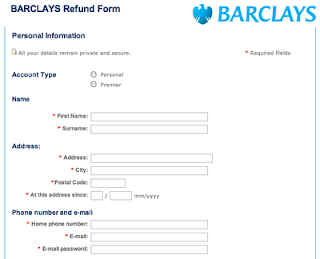 It then gave a link to a web site where, it claimed, I could get a refund. The site was actually a very good replica of the UK tax authority site with links for each of the main UK and international banks. Each link went to a craftily constructed replica of their online banking page and asked not only for your username and password but also your complete credit card details. Yet again it’s critical to know that your bank and no legitimate organization will EVER post you a link like that. Always enter web addresses yourself and then bookmark them for safe-keeping. Did you know that in the next edition of the Oxford English Dictionary they’ve removed the word “gullible”? OK, anyone with a DSTV subscription may recently have seen the inestimable Stephen Fry pretending to fall for this old skeptical joke. It’s an interesting but dangerous experiment to try at home. Do you really want to know which of your family members are hopelessly gullible or, perhaps more diplomatically, “naïve”? Gullibility of course is nothing to do with stupidity or ignorance. There are just some people, often very smart people, who believe anything they’re told. They’re often the people who fall for internet scams, the latest schismatic religious group or the newest pastor in a flashy car and an expensive suit. They’re almost always the people who have their hard-earned money taken away from them. The wide selection of holiday and accommodation schemes and clubs are a good example of this. They are often sold to rather smart and affluent people who already spend a lot of money on holidays and staying away from home. They fall for a slick presentation from a salesman with a cheesy smile and smarmy persuasive abilities. The same salesman who won’t mention how difficult it is to get out of the contract when you change your mind. The type who works for a company who will afterwards just say “caveat emptor” (“buyer beware”) and tell you to get lost. It’s the same with scams. The victims can often be rather intelligent people. Of course it’s very easy to assume that only an idiot will have fallen for it but it’s surprising who the victims can be. Obviously I’m not going to give you any names of victims we know but they’ve included senior managers in large companies, government scientists and even one or two in “the media”. They’ve all been faced with an email offering them a fortune if only they can help remove it from a bank account in a West African nation. Others were approached with offers of romance inspired by their unseen good looks and charming features. All fell for this and ended up either parting with significant amounts of money or, if they checked with us first, narrowly avoided doing so. Despite my general skepticism I can understand how someone can fall for a scam. What I find surprising is that some people fall for the same scammers twice or more. I’ve actually seen these situations several times, but only when they’ve been forwarded to me. That’s because I’ve never been the victim of a scammer myself so I’m not the target of this “follow-up” scam. This type is very specifically targeted at previous victims. The email purports to come from an official organisation like the US Federal Bureau of Investigation and claim they’ve heard that you were a victim of an earlier scam and suggest they can assist in recovering your lost money. I’m sure that reading this you’ll wonder how someone can be so gullible, particularly as all the warning signs are there. If you look closely you’ll see that the FBI seem to have fallen on hard times and are using a free Gmail email address and a cellphone number. You’ll also notice that their command of English is not as good as you would expect. Anyone with a little familiarity with scams would spot this instantly but I suspect it’s different if you’ve recently lost a huge amount of money to a scammer. You’d be feeling embarrassed, ashamed, guilty and in desperate need of help and support. And poor. You’ll be a drowning man grasping at straws. Needless to say, sooner or later, this FBI man would require yet another advance fee for some incidental expense. And yes, some victims end up paying more money in the vain hope of getting something back. As I’ve said many times before the only weapon that truly works against scams and all other forms of deception is skepticism. We really shouldn’t believe things we’re told just because we’ve been told them. That goes for absolutely anything you read in an email that originated from someone you don’t know but is also goes for absolutely anyone who is trying to sell you something. You should obviously research any claims that are made to help part you from your money. Certainly be extremely skeptical about any remarkable claims. As one of my heroes, Carl Sagan, was fond of saying, “Extraordinary claims require extraordinary evidence”. Anyone who claims they have a cure, or think they have a cure for any disease or disorder that does NOT involve a hospital needs to come up with some VERY persuasive evidence. Not long ago I was asked my opinion of a medical trial that a friend had been invited to join to treat her son. The doctor, who wanted her to pay serious money to join this trial, was ready to experiment on her son using so-called “chelation therapy”, a completely unproven therapy for which there is no evidence to support it’s use in his case. In fact many authorities around the world have warned people against using this approach for his condition. If that wasn’t enough the trial appeared not to have permission from the relevant authorities. Luckily the trial appears to have been cancelled after various skeptics did some research and spoke to a variety of doctors who expressed serious alarm at the idea and the word spread. That’s an extreme case but scams are the same, they require research and healthy skepticisn. Whether it’s your wealth or your health skepticism is the very best weapon in the battle against gullibility. I took a pair of brand new dark brown fine wool business trousers to a dry-cleaners in Riverwalk last week. They had never been cleaned before. I explained this to the attendant, and very clearly specified that I wanted dry-cleaning. The bill was P24, of which I paid P14 in advance. When I went to pick them up they look terrible - it looks like they have been washed in a washing machine, and then ironed very unprofessionally, with a lot of water. I complained and the manager offered me not to charge the remaining P10, however I do not find this acceptable, as I will have to put them through another dry-cleaning cycle somewhere else, which will cost me the same at least - the manager has admitted that this is the only remedial action possible. I would like to know what my rights are, i.e. as a minimum I want my money back, which I paid in advance (14 Pula), an apology would be nice but I guess that is too much to ask for. Regardless of whatever else the dry-cleaners do to remedy this situation an apology would obviously be a good place to begin. I’m no expert on dry-cleaning but every time I’ve been inside one there’s been a sign on the wall saying that if something goes wrong it’s not their fault. However, that doesn’t actually excuse them from destroying your trousers. From what you say it sounds like they didn’t know what they were doing in your case and it’s up to them to fix the problem. I suggest you tell them that they’ve comprehensively failed in their duty of care to both you and your trousers and that their offer to waive the remaining P10 is ridiculous. They need to come up with a better solution that ends up with you in happy trousers. I paid a P200 deposit at a furniture store for a sofa in May and agreed that I would pay for the rest on lay-bye over the next month. They assured me that they had it in stock. On 18th June 2011 I made the final payment of the sofa. The sales rep was on leave that day, but the cashier lady told me it wasn’t possible to deliver on that day. I decided not to pay for the delivery and asked the lady to call the warehouse to confirm that they had it. To my surprise they didn’t have it at the warehouse and they offered me the one that was on display instead. Some days later I spoke to the original sales rep and told her my concerns but she told me there is nothing she can do, the manager was out and she will let him know about the situation and she will call me or the manager will call me but I never got a call from them. I eventually spoke to the manager on the phone and he maintained that that there is nothing at the warehouse and the one on the display was the last one. I told him that this was not what I was told when I made the purchase, and I didn’t want the one on display. He said he would speak to the suppliers but I asked him to give me back the money I paid for the sofa but he refused. They continued to tell me to be patient or to take the sofa that had been on display and refused me a refund. You can tell them (politely) where they can stick their horrible display sofa. You should go back to them and explain that they have breached their contract with you as well as breaking a whole variety of the Consumer Protection Regulations. Where shall we begin? Section 13 (1) (a) forbids selling something that “does not match any sample or description” the consumer has been given. They’ve also tried to give you a sofa that isn’t new. That would be Section 13 (1) (c) they’ve broken. They weren’t truthful about the availability of stock which breaches 13 (1) (e) and 15 (1) (d). Failing to give you your money back breaches 15 (1) (e). By being just plain silly they’ve also breached 17 (1) (d). Finally they’ve breached Section 19 of the Regulations that clearly forbids saying utterly stupid things and irritating me personally. Do they really want to be named and disclosed as breaking more rules and regulations than any other supplier this year so far? Give them exactly 5 minutes to give you your money back or their reputation will be in tatters. P.S. I made up that bit about Section 19 of the Consumer Protection Regulations. Over the years we’ve heard of a huge number of “advance fee” scams. They come in all shapes and sizes but one of the smartest is the follow-up investigation scam. The scammer successfully scams a victim and takes his or her money but six months later, using a different free email address and a different re-routable UK cellphone number gets in touch and claims to be from either the FBI or some other agency and offers to investigate the scam. Sooner or later there’s yet another demand for cash, payable via Western Union. A mixture of desperation and gullibility costs the victim yet more money. So if you’ve fallen for it once, be warned, you’ll be targeted again for sure. 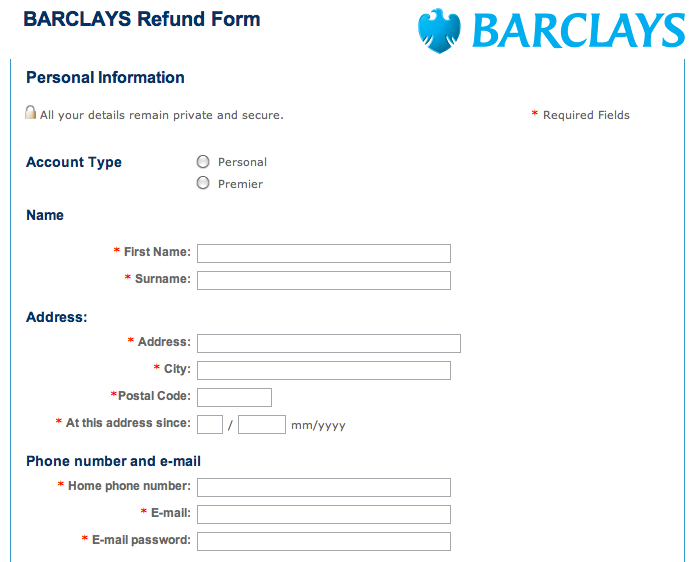 A phishing scam with the worst ever English - "William Hill tax refund"
We regret to inform you that your credt card was used for Gambling, deposit 450.USD, that`s not normal for your credit card transactions.